"Writing about wine doesn't pay very well, but you have to like the benefit package!" A writer who is like a mentor to me said that once, very early in my career, and it's stuck with me. What he failed to mention was the amount of work that this was going to be... who knew that writing about wine would take effort? A few days ago a colleague of mine from Patagonia imports ( http://www.patagoniaimports.com/our_wines.php ) dropped off a few sample bottles for me to taste and potentially write about. Well, who I am to refuse a friend? Then I opened the first bottle, a $27 Malbec-Cabernet Sauvignon blend from Cantinian vineyards ( http://www.cantinian.com/ )... normally I would be super-charged! 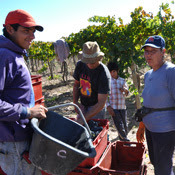 I love Malbec, absolutely one of my favorite varietals; I adore the big, juicy red and black fruit notes, the sullen earthiness is can carry and unabashed self-ness when crafted with care. I opened the bottle, mouth watering, and poured some into a big Bordeaux glass to allow it a chance to breathe properly before I began guzzling. The glass was sending heady aromas in the air before I even lifted it, and I admit to getting a touch dizzy from the perfume. Then I tasted it. Thin, sharp, unbalanced acids were aggressive to say the least and the concentration of flavors couldn't match the puissance of the fine bouquet. Perhaps I just didn't let it breathe enough? So fine, I let the bottle sit open all night, praying that the voracious fruit-flies camped out in my kitchen left my prize alone. They seemed as appalled by the poor vintage as I was... I came back around midnight for a last-effort at redemption but ended up leaving the 95% remaining in the bottle open overnight, more in sorrow then in any effort at further aeration. I had given up, the wine just didn't live up to it's hype. "Not bad; good expression of terroir"
"Brilliant bouquet, lovely bright acids"
"racy little number, should pair well with some slightly fatty grilled meats"
Eh? What's this? Are they talking about the same wine? I put my nose to the glass again; a plethora of Mendoza trademarks aromas burst forth (with more finesse then the night before). A host of dark red berries, warm earth and savory wood-tones with a light cinnamon-spice finish marched through my olfactory. Trepidatiously I tasted the garnet colored liquid; supple body, brilliantly alive acids, crisp and well-punctuated berry tones... this was a completely different wine. What did I learn? Never judge a book by it's cover, or a wine by it's opening notes when it's first poured into the glass. John Schreiner ( http://johnschreiner.blogspot.ca/ ) will always be inspirational to me, not just because he knows more about British Columbia wine then anyone else, but because he is always willing to keep a bottle of wine open for 3-5 days, "just to see what happens". Well John, I've truly learnt the lesson. 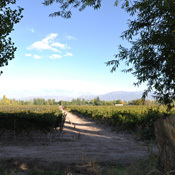 This blend from only minutes outside Mendoza city is brilliantly transparent. If you want to taste a textbook example of "Mendoza-ness", then look no further... just give it a chance to breathe! FOOD PAIRINGS: whilst true that the zippy acids need fat, and a grilled Merguez sausage with eggplant tagine would cosy up to this just fine.. . also consider a Chef Kristof classic: bacon, tomato and aged cheddar sandwich. It has the fat to balance acids, the smokiness to enhance the Argentinian terroir... a lovely way to celebrate the lunch-hour! And so I stand before you, a humbled man. I made a snap decision based on literally thousands of wine-tastings, and I was wrong. I actually had the same thing happen with a brilliant Sonoma Pinot Noir about a year and a half ago, and the sommelier who was with me and I still laugh about it, because we both ended up falling in love with the wine by the end of the night. Wines are living entities; they are born of earth and sweat and sometimes even of love and respect for the place they come from. They sleep in bottles for months, or years, or decades waiting for someone to find them and appreciate them for what they are. Wines have personalities, presence, even the promise of something more... because wine can transport us from one place to another, from one time to another. Wine can ease our burdens, it can lift our sorrows and celebrate our victories. Wine, when it's done well, is a celebration of life. You doubt? The proof my friends, is in the glass. If you even now want top wine and champagne for supper, it is possible to check out this resource website. They have got a broad array you'd better choose from. please ask before posting a link to a business website. I am happy to be supportive of my colleagues, but ask for consideration of my business as well.